One of the world’s legendary conductors, Seiji Ozawa celebrates his 80th birthday in September 2015. To celebrate, this disc of all-new Ravel recordings features one of the composers he has been most closely associated with over his long career. As a student of Charles Munch and Pierre Monteux, Seiji Ozawa studied with two of the 20th century’s greatest exponents of Ravel. In the 1970s he recorded a benchmark set of the complete orchestral works for DG with the Boston Symphony during his record-breaking 29 year tenure with the orchestra. These new recordings derive from the Saito Kinen Festival in Japan with world-class soloists – leading American mezzos Isabel Leonard in L’enfant et les sortilèges and Susan Graham in Shéhérazade – and a hand-picked orchestra of the world’s finest players from Berlin, Vienna, Boston, Cleveland, New York and Philadelphia. 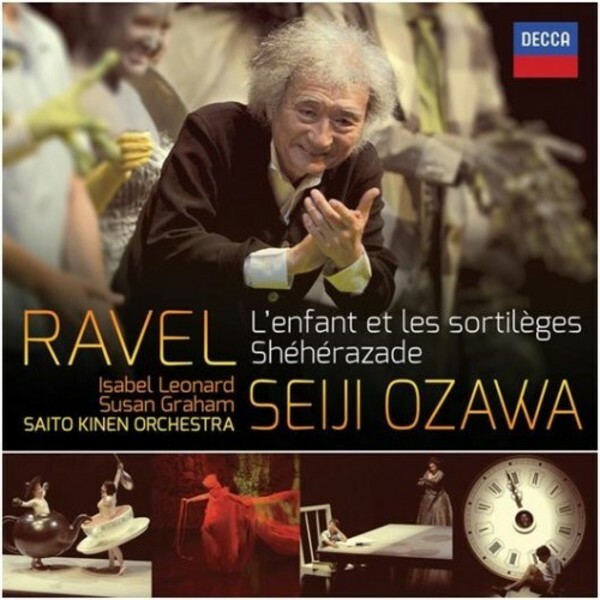 The recording of L’enfant et les sortilèges marked Seiji Ozawa’s first full return to conducting after recovering from surgery for life-threatening cancer in 2013. One of the performances was given in the presence of the Emperor and Empress of Japan who had journeyed to the city of Matsumoto especially for the occasion.